Chairman of US Joint Chiefs of Staff expected to arrive Monday for his last visit on active duty. Chairman of the Joint Chiefs of Staff of the United States Military, Admiral Michael G. Mullen, is expected to arrive in Israel Monday, for what will likely be his last visit on active duty. 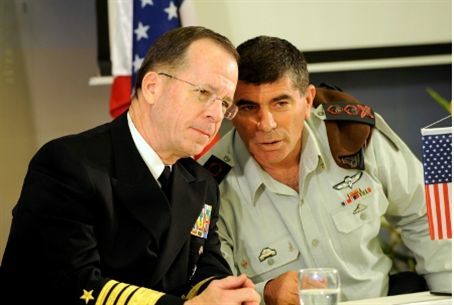 Admiral Mullen will be hosted by the IDF Chief of the General Staff, Lieutenant General Benny Gantz, who will hold a festive dinner in his honor tonight along with senior IDF commanders from the General Staff. This is Admiral Mullen's sixth visit to Israel since he commenced his position as Chairman of the Joint Chiefs of Staff. Admiral Mullen is expected to end his tenure as Chairman of the Joint Chiefs of Staff in September 2011.